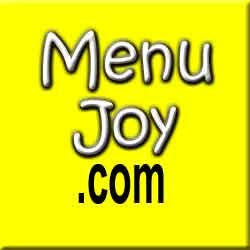 Today is Mom's birthday, and after a morning filled with gift opening and cake discussions, we decided to dust off our $10 coupon that we won from MenuJoy.com and hit up Cyd's Creative Kitchen - a place that we had visited once before and really enjoyed. We pulled into the parking area - which covers front, back, and side parking - at around 11:30 a.m. I had forgotten how cute Cyd's was, and apparently so did Mom because we both squealed at the cozy decor once we stepped inside. Since we could seat ourselves, Mom chose a table that allowed me ample picture-taking room. We were soon joined by our waitress, who was named Sonya (I believe that is how she spelled it). She brought over two large menus and took our drink order. Mom went with a hot coffee ($1.29) while I chose an iced ($2.29). Apparently it costs a whole extra dollar just for ice. Why is that? It's not just Cyd's - every restaurant does that. Mom said that it is because you get more with an iced coffee, and I guess she is right. Anyhoo, Sonya poured Mom's cup right away and quickly retrieved my very large, plastic glass filled with iced coffee. Since we had already checked out the menu on the Internet, Mom and I were pretty much ready to order as soon as the drinks arrived. 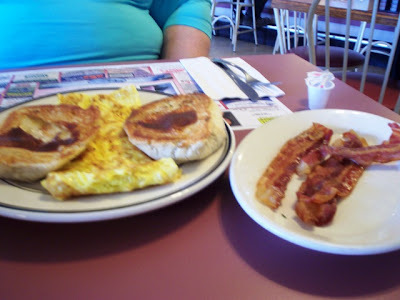 Mom chose a cheese omelet ($4.29) with a side of bacon ($2.29) and a homemade cheese roll instead of toast ($1.09). Mom had been yapping about never having tried a cheese roll before, so she figured that - since it was her birthday, and all - she would finally splurge and order one. 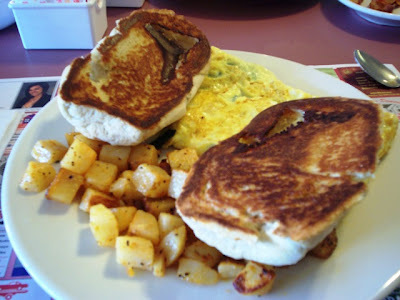 Not wanting to be left out - of course - I also substituted my toast for a cheese roll ($1.09) and ordered a spinach and feta omelet with home fries ($6.49). Sonya took away our menus and left Mom and I to talk more about that upcoming birthday cake and the pleasant decor at Cyd's. 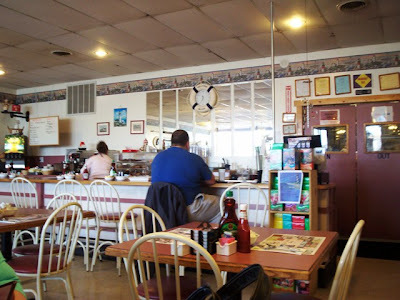 Cyd's is basically your neighborhood diner, only with a more homey feel. With a mixture of both tables, booths, and a counter for individual diners, Cyd's can seat quite a lot of hungry customers. 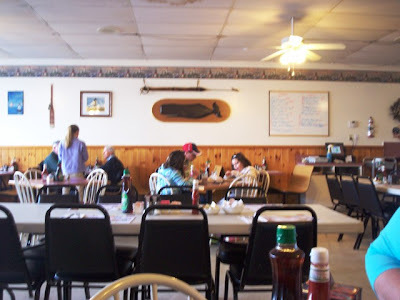 Nautical decorations hung on the walls, and several whiteboards scattered throughout the dining room informed people of the latest specials. A shelf filled with Girl Scout Cookies sat next to the register, and plenty of morning light spilled into the room through the large glass windows. I apologize in advance for the blurry pictures. The attentive waitstaff was scattered throughout the restaurant at all times, making sneaky picture taking a little difficult. Our food arrived in a flash, and everything looked and smelled fantastic. Although I didn't get the waitstaff to sing Happy Birthday to Mom because I didn't want to be killed, this breakfast was a great way to start her day. Mom said that her cheese omelet had a perfect amount of filling, was a good size, and tasted very fresh. Her side of bacon was cooked perfectly and was deliciously meaty and crisp. The added surprise was the cheese roll. She was definitely not let down with her choice to finally try one. With a sweetness almost reminiscent of a Portuguese sweet bun, Mom felt that this was a wonderful change from having a plain piece of toast or an English muffin. The sweetness of the bun mixed well with the savory cheese, which filled the bottom half of the toasted soft roll. She would definitely order this again. I also had a great time eating my breakfast. Although I did feel that my omelet could have had a bit more spinach and feta, there was a taste of the two in every bite. My home fries had a lovely potato taste, while my cheese bun was deliciously buttered and sweet. What a great way to kick off Mom's birthday! Although we had a $10 coupon, we still made sure to add in Sonya's tip before we subtracted the discount. She was great, and shouldn't have to be cheated out of a tip just because we had a coupon. Too many people do that to waitresses! We left $24 on the table (well ... $14 and the coupon) and before leaving I decided to use the restroom, which was very clean and neat. According to the menu (see above link), Cyd's is open on Friday nights. If they do dinners they way they do breakfasts, then I think that Mom and I should go back as soon as possible. If we had half ratings (we currently only use 1-5), we would have scored this a 3.5. 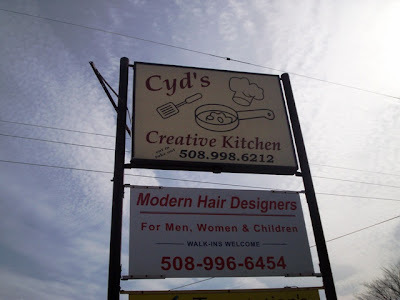 However, because of the deliciousness that is Cyd's, New England Bites is now rethinking our whole grading system! Both Mom and I really enjoyed our breakfast, and I am glad to say that she had a great birthday. Cyd's is definitely a place that we will return to - with or without coupons. 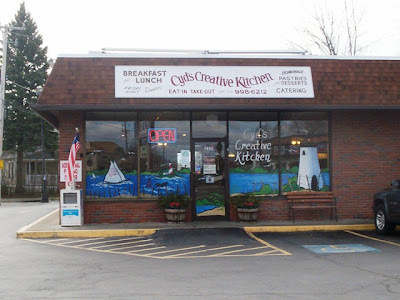 Cyd's Creative Kitchen is open from 6 a.m. to 2 p.m. Monday through Saturday for breakfast and lunch, 4-8 p.m. on Friday night, and 6 a.m. to 1 p.m. on Sunday for breakfast.